If you’ve been keeping a close eye on flooring trends in recent years, you’ll have noticed a distinct rise in the popularity of bamboo flooring. Once a little known, somewhat bijou, alternative to hardwood flooring, bamboo floors are now available from several major retailers including Home Depot, Costco, BuildDirect and Wayfair and offer an affordable and chic option for most homeowners. 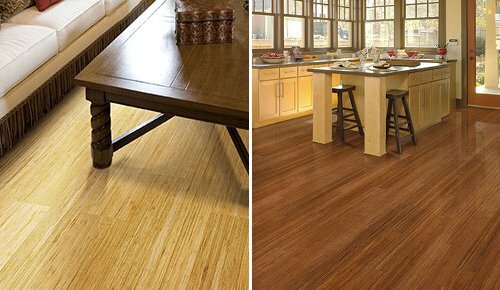 In this Home Flooring Pros blog post we take a look at the different types of bamboo flooring available and offer up our bamboo flooring review of the best brands, manufacturers and retailers for you to consider. For more information on bamboo flooring please consult our buying, prices, installation and cleaning guides. Despite its increased popularity, there still seems to be a fair bit of confusion about the different types of bamboo flooring, so here is everything you need to know to make the best decision about which kind will suit your project. For free installation estimates in you area CLICK HERE. First of all, there is solid bamboo flooring. 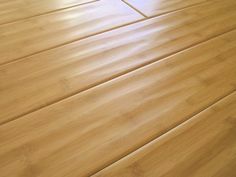 However this does not mean a single sheet of bamboo cut into planks – that would be impossible as bamboo does not grow that wide – in fact the manufacturing of all solid bamboo flooring involves pieces (strands, stalks or strips) of bamboo that are fused together using pressurization and adhesives. 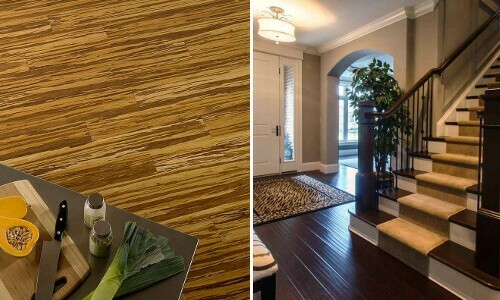 The main advantage of solid bamboo flooring is that it is eco-friendly, natural and characterful looking flooring product, and it is possible to sand down and refinish solid bamboo planks in order to refresh them or repair damage. The main disadvantages of solid bamboo, is that like hardwood planks, it is advisable to have it professionally installed and the general rule of thumb is to avoid installing it in “wet” areas – particularly bathrooms and basements. This is because, even with good waterproof finishes, solid bamboo flooring is prone to swelling in areas that have heavy moisture levels. 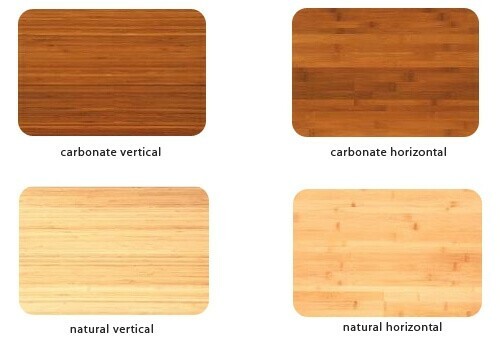 Within the solid bamboo floor category, there are in fact three sub-categories: horizontal, vertical and strand woven. Each of these sub-categories refers to the way the plank is created and this gives different attributes to the plank, both in looks and hardness. With horizontal bamboo flooring, the strips of bamboo are set out horizontally to make a plank and this results in giving the plank a more authentic look, with the “knuckles” that you would instantly associate with bamboo being clearly visible. With vertical bamboo flooring, the bamboo stalks are laid out vertically and the result is a plank that does not have “knuckles” but rather is more uniform in nature with a striped aspect to it. The picture below demonstrates this well. Aside from the differences aesthetically, there is little else that differentiates horizontal and vertical bamboo: they both have a similar level of hardness and tend to be similar in price. 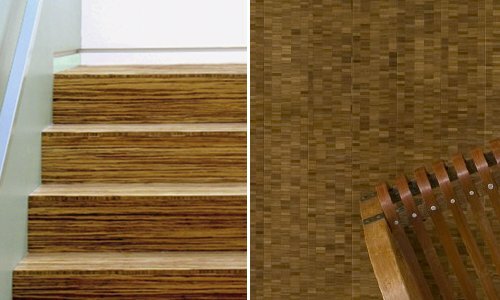 With strand woven bamboo flooring, rather than gluing the strips of bamboo together in one direction or the other, strands of bamboo fiber are actually woven together. The process results in a look that is a little less “busy” than the stripy vertical bamboo and, unlike horizontal bamboo, no “knuckles” are visible. The major advantage of strand woven bamboo is that it is the hardest and most durable of all types, a fact that is reflected in its more costly price bracket. Finally, “carbonized” is another term you may see when looking at bamboo flooring. As opposed to “natural” bamboo, which is very light in color, carbonized bamboo has undergone a process to darken the bamboo fibers; meanwhile “tiger” bamboo planks are made up from mixing natural and carbonized fibers; and of course stained bamboo is exactly that – stained with pigment to give it (usually) a very dark tone. Be aware that carbonized bamboo is softer than natural bamboo, so less appropriate for high traffic areas like kitchens and entry halls. Engineered bamboo flooring is a clever alternative to solid bamboo: only the top wear layer is made from solid bamboo while the remaining layers are made from a mix of other wood materials, glued together to provide a much more stable product. Whether it comes in tongue and groove or click and lock planks bamboo engineered flooring offers a more versatile option. The main advantage is that engineered bamboo is super hard, less prone to scratches or dents; also it is very easy to maintain and install. Plus because it is much more water-resistant than solid bamboo, you can use engineered bamboo flooring in bathrooms. However, because the bamboo layer is very thin, when the wear layer eventually erodes you cannot simply refinish engineered flooring – it will have to be replaced entirely. To this end, choose planks that have the thickest wear layer you can find to maximize the shelf life of your floor. Need something even more durable and/or cheaper than solid or engineered bamboo? 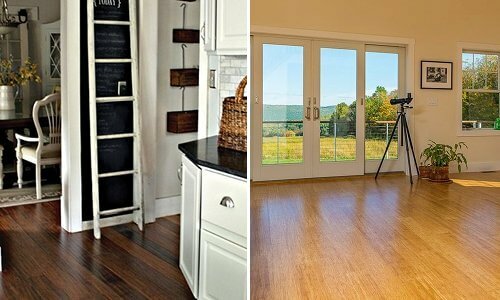 If you’re looking for a bamboo floor look, but real bamboo is either too expensive or simply impractical, then you can turn to laminate or vinyl flooring as an alternative. Laminate flooring with it’s tough, clear resin wear layer and easy click and lock installation uses a printed image, much like a photograph, of bamboo flooring to imitate the real thing and offers one of the most durable flooring options around. 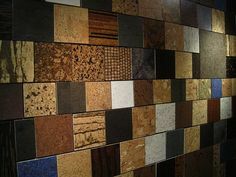 Vinyl flooring is also becoming popular again too thanks to the emergence of luxury vinyl tile and plank. Although not to everyone’s taste bamboo vinyl plank flooring is a practical and hard wearing option especially in high traffic and wet areas of the home. Plyboo – We start our bamboo flooring reviews at the top end of the market, Plyboo was established in 1989 (one of the first US bamboo floor specialist companies), have impeccable environmental standards and now use a ground-breaking soy-based, formaldehyde-free adhesive system to produce their bamboo products. This rigor is enough alone to justify the higher price bracket of their products (from $4.30 up to $6 per square feet), but added to that is the sheer gorgeousness of their bamboo flooring! Aside from their beautiful strand woven floors, they also have a couple of quite different floors that you won’t find anywhere else such as the Plyboo Squared where the bamboo has been laid out in an end grain orientation which makes it look like mosaic squares, and the specialist Plyboo Sport bamboo flooring specifically designed for high impact sports courts. Plyboo also offer a superb collection of carved and textured bamboo panels that are fixed to walls to great effect. 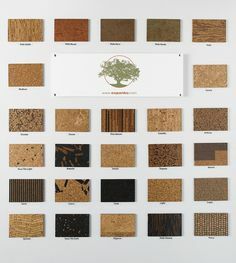 Teragren – Established in 1994, Teragren was also among the first US companies to promote bamboo as a sustainable construction material, offering not just flooring but also plywood panels and worktops. Teragren have an impressive track record of not only delivering high quality products, but also ensuring fair trading practices with their Chinese farmers and factory workers and being committed to “environmentally sensitive specifications… that has no negative impact on human health”. They currently have eight ranges of bamboo flooring, each offering several different colorways, finishes and coordinating flooring accessories, moldings etc. My personal favorite is the Visions range which offers nine different colorways including a couple of grey toned planks that are bang on trend for 2014. I also really like their excellent user-friendly website that gives clear technical and easy to understand information; for example, alongside the Janka score for hardness, they explain it as a percentage difference to traditional oak! 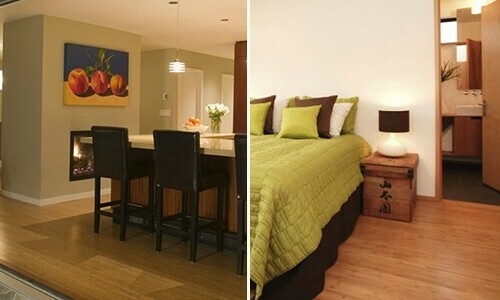 Ambient Bamboo Floors – Established in 2005, Ambient bills itself as a one-stop shop for all your bamboo flooring needs; indeed they do have a comprehensive range of matching trims, moldings and installation materials for their floors and the fact that all their flooring is free from urea formaldehyde is a massive bonus too. Ambient’s range is mainly made from a large selection of strand bamboo flooring in different finishes, covering all shades from the nearly white Malaga Strand to the almost black Java Strand, and including striking options like the Tiger Strand and on-trend gray options too. They also have a smaller selection of horizontal and vertical bamboo floors; and an interesting line of eucalyptus flooring. All of Ambient’s strand bamboo floors can be installed over underfloor radiant heating and prices range from aas little as $2.89 per square meter. Cali Bamboo – This San Diego based company also promotes bamboo as a eco-friendly building material. As well as their flooring, they offer a range of other bamboo products including a seriously awesome composite decking product that is made from 60% reclaimed bamboo fibers and 40% recycled HDPE plastics. Cali Bamboo is clearly committed to green technology and even contributes a percentage of its revenue to environmental organizations, so if green credentials are important to you then this is a great choice. It’s also home to one of the hardest strand woven bamboo flooring in the market – with a Janka score of over 5000 – that comes in a comprehensive range of colors, styles and sizes; and they also have a click lock easy installation version and edgings, nosings and stair risers to match. EcoFusion – EcoFusion are developing excellent eco-alternatives which “blend renewable and recyclable products… and ‘fuse’ them into innovative flooring solutions”. 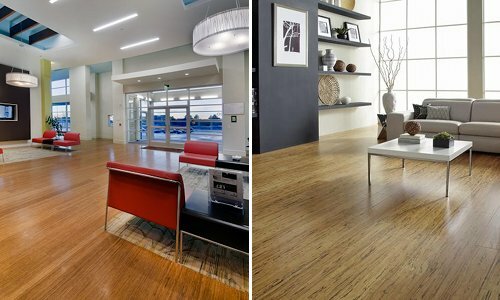 In the case of their rather unique Color Fusion and Strand Woven bamboo floor ranges, that means blending bamboo strands and recycled hardwood sourced from furniture makers. And with their Color Fusion range they take their technology even further by dyeing the bamboo strands in plant-based pigments, resulting in some truly gorgeous deep toned bamboo floors that are quite different from much on the market; like the super chic slate grey toned Morning Mist bamboo floor pictured below right. Other great reasons to recommend EcoFusion are that their products contain no added urea formaldehyde and that they offer a 35-year warranty. Prices range between $4 and $8 per square foot. Yanchi (available at Buildirect.com) – Our next bamboo flooring review is this cost effective range manufactured by a Chinese corporation for over a decade and now exclusively retailed through the BuildDirect website. It may not seem wise to buy flooring via the Internet, but the great news is that BuildDirect are more than willing to send you free samples and their website also has a lot of information detailing things like installation and maintenance. The Yanchi product range is truly extensive with bamboo floors available in different thickness gauges and finishes, strand woven or horizontal, extra wide planks, and even 15 selections that can be installed over underfloor heating systems. Beware, however, that their budget selections under $2 per square foot tend to be the carbonized horizontal bamboo, which is softer than strand woven, and much more prone to dents and scratches. Home Legend (available at Home Depot) – The Home Depot company stock a very comprehensive range of bamboo floor planks from Home Legend, with over 300 different bamboo products listed, including hand scraped, strand woven, horizontal, click lock and tongue and groove options, as well as bamboo nosings and moldings too. As you would expect from a leading home improvement store, the prices at Home Depot are pretty competitive ranging between $2.30 – $4.50 per square foot and there’s a good range of colors and styles of bamboo flooring, although Home Legend does tend to err on the more conservative side of things (no greys or whitewashed options here). There have been some mixed reviews of Home Legend products, particularly when used in a floating floor system, so please do your research and ensure that you are matching the right product to the correct specifications of your project. Have we omitted a brand that you’ve installed and love? Please let us know about your bamboo flooring project by leaving a comment below or contacting us via email. And take a look at our Bamboo Pinterest Board for more design ideas. And if a sustainable product is one of your main flooring criteria the take a look at our cork flooring reviews by clicking here. What about “Premium Green Bamboo”? This is great information on Bamboo….we saw some carbonized strand woven that looked nice? We have heard that Mayfield was one of the companies recommended for Bamboo? We were ready to put it in our kitchen, but read all these reviews about it scratching…so have held off…might rethink that! Thank you for the kind words Kathy. I’ve not heard of the company you mention…is it really a brand of bamboo flooring? 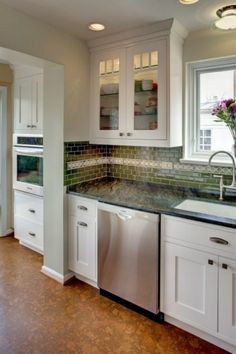 As we mention in the article, strand woven bamboo offers great durability but the process of carbonizing bamboo can soften the floor making it less durable…the kitchen is definitely a high traffic area so you need to be careful, but all high quality (often high priced) products should stand up well and should come with a long life guarantee. We have looked at Java Fossilized Bamboo floor from Cali Bamboo for our main floor…except for kitchen where we are planning to put tile. We have heard many conflicting views regarding bamboo and even Cali as a supplier…so now I am confused whether we should go with bamboo or stick with the traditional oak wood floors instead? Can u please advise…thanks. Hi Shah, thanks for your comment. The internet can be a confusing place, especially when it comes to reviews, you can always find negative reviews whatever the product. My view has always been to take any concerns direct to the manufacturer/retailer before you make your purchase. The guys at Cali Bamboo are very friendly so why not get in touch and describe your project in full? Looking in a big box store (can’t remember its name) that carries 20-30 different bamboo flooring choices almost all of the Eco forest label.they sell individual planks as samples from open, dedicated boxes for this purpose. So, it is good to also see the product acclimating and this is the bizarre part! All of the engineered bamboo products were warping and cupping! None of the solid bamboo products were doing this. Didn’t matter if the product was natural, carmelized, stranded, board width, or thickness. So, simplest interpretation is that engineered flooring isn’t as good as advertised at least in the drier climate where this was. Or is it that solid bamboo is known to have superior dimensional stability than engineered flooring? Anybody help make sense of this? We are looking at new flooring for our entire home. We have older kids and dogs. Would like a great option that holds up and is priced reasonably. Sales guy today told us we “have to go with Bamboo”. They sell Morning Star Bamboo advertised as one of the best bamboos out there. Any opinion on this company and their bamboo? Looking at their Hand scraped honey strand click..
Pete- Don’t go with Morning Star- see complaints with Lumber Liquidators on Consumeraffairs.com. 1). Product scratches easily. 2). People are experiencing shrinking within the suggested humidity range. 3). If using their installation services, make sure YOU VERIFY their installer- they claim they authorizing “Professional Installation Specialists”, whom they referred to me was nothing more than a handy man- disregarded acclimation, tried to do the repair without proper acclimation, and HSS wanted to make me allow him to fix it- even though he was exposed to not be a professional. He used improper perimeter spacing, didn’t use expansion strips….and HSS assured me they were professional installation specialists. Made excuses for him! They’ve been using him since 2013- how many other people’s floors are failing- boards ruined- and probably being told it’s their fault because of site related issues- or blaming them because their house had moisture problems a REAL installation specialist would have diagnosed. The warranty only gives you replacement boards IF there are so many of them (defective by a standing and looking down) standard, that they total 16-20% (it’s dense and exotic of the installed floor. See the truth in advertising lawsuit in North Carolina online- Reference LL statement to the SEC regarding quality control of boards and labor. I warned LL to let them know HSS wasn’t authorizing installers to fit their advertisements- they said it was “between the customer and the installer”. The HSS contract that sounds like boiler plate language applying to unforeseen circumstances- more like a warning of what you can expect from installers that make mistakes that they will allow to remain authorized- as long as the agree to fix what they mess up—WITHIN ONE YEAR. After that- too bad. Again- my “installer”, has been with them for OVER A YEAR. Also appears to have multiple felony records. Registered his business in late 2012. Btw, a Local New York news crew Did a consumer piece on Lumber Liquidators and their bamboo flooring, Lumber Liquidators Corporate (owns Morning Star), stated were they went “wrong” was they “used a general contracted and not a floor installer”. They know HSS is referring General contractors but doesn’t change their advertising to reflect this or the risks posed by using a G.C. Sad to see so many people be led to believe it’s an “easy” install when installation is more than cutting and clicking boards. We unfortunately purchased morning star bamboo for our entire first floor. We should have researched more about Bamboo. EVERYTHING scratches it. It looks beautiful at first glance until you notice all the gouges and scratches. I would hate to see this floor if we had kids or pets. This is good information. My wife and I are replacing the floors throughout the main level, including the kitchen, and are looking into bamboo as an option. I understand that all bamboo is not created equal and “you get what you pay for…” I’m a fairly handy guy and want to install it myself, so I’m thinking engineered is the way to go. 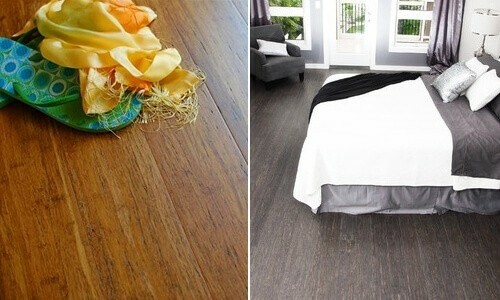 How is the quality of the Home Decorators Collection bamboo flooring (available at Home Depot)? I’m looking at things like warranty, layers of protective finish, etc. I certainly don’t want to buy a bad product but can’t afford a $6/sq ft product, either. I need a good solid product that will install easily, last for years, and not break the bank. I’m wondering if such a product exists! I was curious if you made a decision on your flooring yet? I was also looking at the Home Decorators brand offered at Home Depot and was curious if you have any feedback. I absolutely hate my teregren bamboo floor. It is in the kitchen and we have no kids or pets yet anything dropped on the floor and then wiped up leaves streaks. And don’t drop anything with any weight or it will leave a dent. Forget what you hear about it being a hard wood. It is actually very delicate. I have tried all kinds of cleaners and microfiber cloths even the famed Bono but everything leaves streaks. I hate it. Did I say I hate it? Absolutely NOT recommended for homes with kids or pets!! Anyone used product from Cali Bamboo? I’m looking at wide click Mocha for living, dinning rooms and study. Any advice? I was looking ate the same product from Lowes and I am having a hard time deciding if I should go with hardwood or bamboo. The Cali Mocha Fossilized looks great and the finish looks like it holds up to spills but it’s very absorbent on the cut edges. I am not convinced yet. I was given a large sample of the Cali bamboo fossilized woods from Lowes. I took one end and put about 3″ of it in a bucket of water for 24 hours. Result was swollen and dark but as it dried the swelling went away and the normal coloring came back, only a very small Crack opened but very difficult to see. More of a very thin straight line. This was a extreme test, I would more than trust this floor for the normal spills and splashes. I absolutely loved my Cali Bamboo floors. They exceeded my expectations and will buy them for our next home. I never had problems with scratches or cleaning. I can’t say enough about the product. They will send you some samples and you will see the quality. i am looking at natural floors antique bamboo flooring from lowes and would like any feedback pros and cons people may have experienced with this product….thanks. Hi Floor Pro – how do you measure moisture content of the planks? I did a home last year, glued down with bostiks best urethane adhesive on a concrete substrate, boards had plenty of time to acclimate. Teragren is saying it was because of the glue that it’s cupping, mind you we live in a humid environment, Sitka Alaska. Professional thoughts? Thank you for your advice. You said in an earlier post that you prefer glue down to nail down. I’ve heard that it’s good to do both. Thoughts? I’m considering purchasing the Cali strand woven solid eucalyptus from Lowes. I live in Nashville Tn and worry that the humidity here will impact the integrity of this floor. There does not seem to be many of these floors installed in this area, which makes me nervous to use installers (from Lowes) if they haven’t done many of them. Any thoughts, suggestions, recommendations would be greatly appreciated. About 2 years ago I purchased the Home Legend Bamboo flooring for my 850 sqft condo. The installer came in and did the installation and it looked great – until it started coming apart. Home Depot sent him out to check it and he glued those areas that were separating. It’s still coming apart and an independent installer came out to see it. He said that this particular flooring installation calls for transition strips to be installed in each doorway. Honestly, I’m really surprised by that since neither Home Depot nor the initial installer said this when it was first purchased. I may have gone with a different product because the transition strips look stupid and for 850 sqft there’s no real reason for it. I mean, it’s not like a lot of open space. Regardless, I don’t recommend the Home Legends product line. I thought I ordered the solid bamboo from the Floor Store. When it was delivered the bamboo was 6year premium moso strand woven bamboo. I was told it is superior to the solid. Strand woven bamboo is typically stronger and more durable than other types so in that sense yes it is often seen as superior. Hi, I live in Memphis, Tn where it is very humid most of the year and i want bamboo for my home. I was thinking strand, but what do you suggest and what do you suggest for installation. Thanks in advance. Hi, I’ve been searching for costumers reviews about Bamboo Flooring and so far this has been the most educational one. 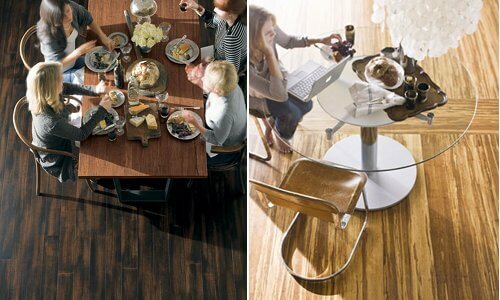 We have look up and down through all flooring stores in Santa Clarita and San Fernando Valley in CA. The most difficult part is to find the right color and we did in a Engineered Bamboo from a Cali Bamboo. Would anyone comment base on experience if this is a good choise for a two story Townhouse, first floor is concrete, second floor is play wood. Is engineered bamboo hard enough? Our first choise was Oak but weblove the color Napa Fossilized Wide T&G Hybrid Bamboo from Cali Bamboo. We don’t want to do a bad day investment and regret it later on. Any advise? Any advice on Eco Forest Patina Locking Solid Stranded Bamboo sold by Floor and Decor? their installer sats he only does glue down. I have heard good and bad about Eco Forest. We have our 1600 sq. Ft home done in Eco Forest Nautica Black and we absolutely love it… It doesn’t scratch, stain or wear and clean up of spills or dirt is very easy with no streaking. Highly recommend! We have Eco Forest Salvador. We love it, although it turned out to be way more rustic looking than we were expecting. Because of the pattern, there is no scratching, denting, etc. It’s so durable! To answer your question, Robin, we live in Atlanta (really humid!) There’s been no off-gassing. The only thing I would caution is this: we bought the click-lock installation type. The salesman at Floor & Decor advised us to buy Sika-T21 glue to glue it down. Later, we were told by another flooring company that click-lock is not supposed to be glued down! We did have a lot of issues at the beginning of noises when we walked on the floor, but we got the installation company to come and insert more glue everywhere we heard the noise. Now it’s perfect and no problems. But we’re rather upset that Floor & Decor told us to glue it down, when it is supposed to be a “floating” floor. I’m thinking of having bamboo or eucalyptus flooring installed in three bedrooms. This would be on a slab. I’ve read that the lighter the color the stronger and more scratch resistance it is. Is this true? Also is solid strand the best choice? Do any companies still use formalahyde? I bit the bullet and purchased Urban Gray Eco Forest elements Bamboo flooring from Floor and Decor. I think the biggest question everyone has is what CLIMATE are people installing these in that they aren’t having any issues with installation? Im in a dry climate so its recommended I use an HVAC system or a humidifier in the PERMANENTLY. I will unfortunately be doing the install myself and am extremely concerned about having issues with pop up. I’ve done glue down flooring for my job for glue down carpet but I’ve never done it for Bamboo flooring. Am I in over my head? should I return it? Or should I risk it and have the flooring look the way I want? Any ideas on this type of flooring? After mixed reviews I am terribly worried that we are going to have issues with this flooring.